Other information cannot be injected into the conversation by third parties. How Does Secure Socket Layer (SSL or TLS) Work? The mechanism and language (i.e. protocol) by which one email server transmits email message(s) to another email server is called SMTP (Simple Mail Transport Protocol). For a long time now, email servers have had the option of using TLS to transparently encrypt the message transmission from one server to the other. Use of TLS with SMTP, when available, ensures that the message contents are secured during transmission between the servers. Not all servers support TLS! allocate additional computational resources on the email servers involved. For these reasons, many email providers, especially free or public ones, have in the past not supported TLS at all. Over the last 5 years, however, the trend has been to add TLS everywhere. Now, the majority of providers do support TLS — 82.3% of domains tested as of (July, 2018). For TLS transmission to be used, the destination email server must “advertise” support for TLS (see: How to Tell Who Supports TLS for Email Transmission) and the sending computer or server must be configured to use TLS connections when possible. No TLS — never use it. Opportunistic TLS — use it if it is available, if not, send insecurely. How Secure is SMTP TLS? 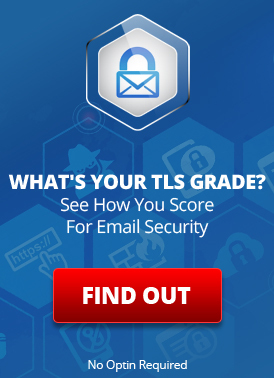 TLS protects the transmission of the content of email messages. It does nothing for protecting the security of the message before it is sent or after it arrives at its destination. For that, other encryption mechanisms may be used, such as PGP, S/MIME, or storage in a secure portal. However, transmission security is all that is minimally required of many organizations (i.e. banks and HIPAA/health care) when sending to customers. In such situations, enforced use of TLS is a good alternative to stronger and less user friendly encryption methods (like PGP and S/MIME) and can prevent the insecure delivery of email. The transmission itself is as secure as can be negotiated between the sending and receiving servers. If they both support strong encryption (e.g. AES 256) then that will be used. If not, a weaker grade of encryption may be used. The sending and receiving servers can choose what kinds of encryption they will support — and if there is no overlap in what they support, then TLS will fail (this is rare). 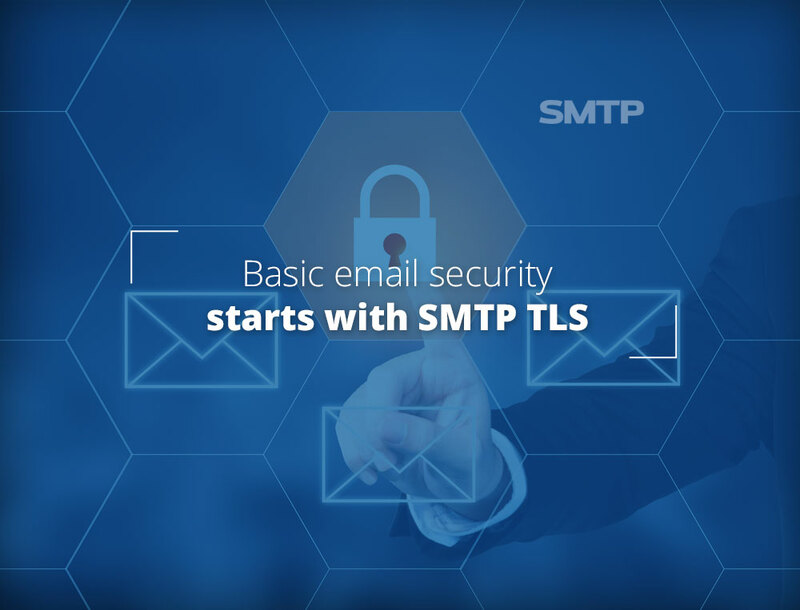 There are other deficiencies in the way that SMTP TLS is actually implemented in practice by most email servers on the Internet. For example, TLS certificates are generally not validated, leaving SMTP TLS open to active man-in-the-middle attacks. For more information, see: Stronger Email Security with Strict Transport Security. What about Replies to Secure Messages? The recipient’s servers do support TLS for outbound email (there is no way to test this externally). Your mail servers (where your “From” or “Reply” email address is hosted) support TLS for inbound email. Both servers support overlapping TLS ciphers and protocols so they can agree on a mutually acceptable means of encryption. Conservatively. If you must proactively ensure that replies are secure in all cases, then assuming TLS will be used is probably not a good assumption. In this case, you should a service (like SecureLine Escrow) whereby your messages are encrypted and stored in a secure portal where the recipient must go to view the message and reply securely. Or, you and your recipients can go the extra mile and setup PGP or S/MIME for use. What is new with SMTP TLS? A receiver’s support of the SMTPTLS option can be trivially removed by an active man-in-the-middle because TLS certificates are not actively verified. In such cases, opportunistic TLS will deliver messages securely and forced TLS will not deliver the message. If any aspect of the TLS negotiation is undecipherable/garbled, then encryption is not used. It is very easy for a man-in-the-middle to inject garbage into the TLS handshake (which is done in clear text) and have the connection downgraded to plain text (opportunistic TLS) or have the connection fail (forced TLS). Even when the SMTP TLS is offered and accepted, the certificate presented during the TLS handshake is usually not checked to see if it is really for the expected domain, and unexpired. Most MTAs offer self-signed certificates as a pro forma. Thus, in many cases one has an encrypted channel to an unauthenticated MTA, which can only prevent passive eavesdropping. Why? Because this is still better than plain text email delivery. There are new solutions that help remedy these issues. For example, SMTP Strict Transport Security. SMTP STS enables recipient servers to publish in DNS information about their SMTP TLS support. This prevents man-in-the-middle downgrades to plain text delivery, ensures stronger TLS protocols are used, and can enable certificate validation. Unfortunately, SMTP STS is still only an internet draft specification, and is not yet widely used. Fortunately, enabling SMTP STS does not hurt compatibility with systems that do not yet support it. What about TLS at LuxSci? LuxSci inbound email servers support TLS for encrypted inbound email delivery from any sending email provider that also supports that. For selected organizations, e.g. Bank of America and Proofpoint, LuxSci also locks down its servers so that it only accepts email from them if its is delivered over TLS. LuxSci outbound email servers will always use TLS with any server that claims to support it and with whom we can talk TLS v1.0+ using a strong cipher. If the TLS connection to such a server server fails (due to misconfiguration or no security protocols in common), the message will not be sent. Outbound opportunistic TLS encryption is automatic for all LuxSci customers, even those without SecureLine. LuxSci servers will use the strongest encryption supported by the recipient’s email server that is also considered strong. LuxSci servers will never employ an encryption cipher that uses less than 128 bits (they will failed to deliver rather than deliver via an excessively weak encryption cipher) and they will never use SSL v2 or SSL v3. LuxSci servers use “Forced TLS” with recipient servers that support TLS if email is being sent to those servers from any SecureLine account using TLS-Only delivery services (outbound email or forwarding). This ensures that messages will never be delivered to such servers, even in the case that they stop supporting TLS suddenly. Forced TLS is also in place for all LuxSci customers sending to certain Banks and organizations that have requested that we globally enforce TLS to their servers. Does LuxSci have any other Special TLS Features? SMTP MTA STS: LuxSci’s own domains support SMTP MTA STS and LuxSci’s SecureLine encryption system leverages STS information about recipient domains to improve connection security. Try TLS: Account administrators can choose to have secure messages “try TLS first” and deliver that way. Only if TLS is not available would the messages fall back and use more secure options like PGP, S/MIME, or Escrow. This makes email security easy, seamless, and automatic when communicating internally or with others who support TLS. TLS Exclusive: This is a special LuxSci-exclusive TLS sending feature. TLS Exclusive is just like Forced TLS, except that messages that can’t go TLS are just dropped. This is ideal for low-importance email that must still be complaint. E.g., email marketing email in healthcare. In such cases, the ease of use of TLS is more important than the actual receipt of the message. TLS Only Forwarding: Account administrators can restrict any server side email forwarding settings in their accounts from allowing forwarding to any email addresses which do not support TLS for email delivery. Encryption Escalation. Often, TLS is good for most messages, but some messages need to be encrypted using something better (e.g. forcing recipients to pick up the message in a secure portal). LuxSci allows you to escalate the encryption from TLS to Escrow with a click (in WebMail) or by entering special text in the subject line (for messages sent from email programs like Outlook). When TLS delivery is enabled for SecureLine accounts, messages will never be insecurely sent to domains that purport to be TLS-enabled. I.e. TLS delivery is enforced and no longer “opportunistic”. The system monitors these domains and updates their TLS-compliance status daily. Double Encryption: Messages sent using SecureLine and PGP or S/MIME will still use Opportunistic TLS whenever possible for message delivery. In these cases, messages are often “double encrypted”. Encrypted first with PGP or S/MIME, and then that secure message may be encrypted again during transport using TLS. No Weak TLS. Unlike many organizations, LuxSci’s TLS support for SMTP and other servers only supports those protocol levels (e.g. TLS v1.0+) and ciphers that are recommended by NIST for government communications and which are required for HIPAA. So, all communications with LuxSci servers will be over a compliant implementation of TLS. For customers whose security or compliance needs allow TLS to be a sufficient form of email encryption, it enables seamless security and “use of email as usual” security. SecureLine with Forced TLS enables clients to take advantage of this level of security whenever possible, while automatically falling back to other methods when TLS is not available. Of course, use of Forced TLS as the sole method of encryption is optional; if your compliance needs are stronger, you can disable TLS-Only delivery or restrict it so tat it is used only with specific recipients. Does TLS Corruption Spell the end of SMTP TLS? Who does not support SMTP TLS for Secure Inbound Email Delivery? This entry was posted on Monday, October 2nd, 2017 at 7:13 am	and is filed under AAA Featured Articles, LuxSci Library: HIPAA, LuxSci Library: Security and Privacy, Popular Posts. You can skip to the end and leave a response. Pinging is currently not allowed. You mean in case of opportunistic TLS messages will be delivered INsecurely no ? Yes — if using opportunistic TLS and there is a man-in-the-middle, then that person could alter the conversation to make it appear that the server does not support TLS, and thus the message would be delivered insecurely. This is the down-side of “opportunistic” vs “forced” use of TLS. Also, I wonder what you encountered (e.g. some insecurely linked image somewhere) that is triggering this “insecure connection” warning. Generally, our site does not produce that and if you can see what is triggering it, we would be interested in fixing that issue.